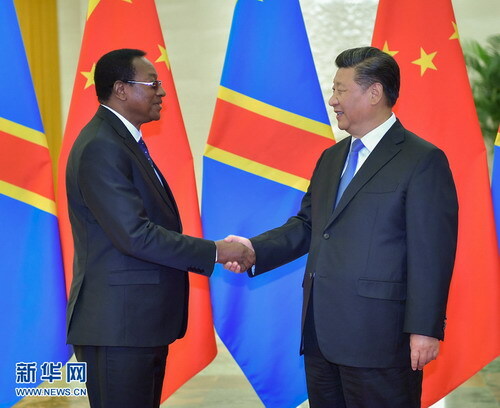 BEIJING, Sept. 6 -- Chinese President Xi Jinping on Thursday met with Prime Minister of the Democratic Republic of the Congo (DR Congo) Bruno Tshibala after the 2018 Beijing Summit of the Forum on China-Africa Cooperation (FOCAC) concluded Tuesday. China has always firmly supported the DR Congo in safeguarding its sovereignty, independence, and territorial integrity, promoting its political process, and opposing external interference, Xi said. Expressing China's support to the DR Congo government's efforts to maintain peace and stability and achieve economic and social development, Xi said China is ready to deepen exchanges and mutual learning as well as win-win cooperation with the DR Congo and help the country translate its abundant resources into development advantages so as to realize its goal of becoming an emerging market economy by 2030. China will continue to help the DR Congo enhance its ability to maintain peace and stability. China will also actively participate in the peacekeeping missions of the United Nations in the DR Congo, Xi said. Tshibala said the FOCAC Beijing summit fully reflected the importance China attaches to Africa and came as evidence that Africa and China can build a community with a shared future. The Africa-China cooperation is highly complementary and mutually beneficial. 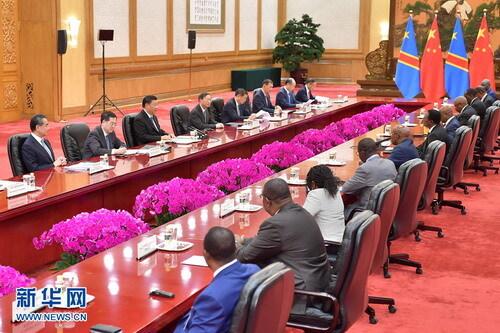 Tshibala said his country has always valued the bilateral relations and is grateful to China for supporting the DR Congo's national independence and development, and upholding justice in multilateral organizations. The DR Congo is willing to deepen cooperation with China and supports the Belt and Road construction, he said.